Factors and multiples form many quick, and seemingly easy, questions in the transfer tests. What these questions are really examining is times-tables knowledge. If you lack confidence on your tables, you may find these challenging. Often, young people learn times-tables in a sing-song way where they rhyme off their, say, seven times tables much like a song. Many primary school teachers motivate their classes with times-table challenges where a competition is built around getting your multiplication tables written out quickly. This is great because it internalises the tables but the higher-level skill which is examined in the transfer test is using those tables to solve mathematical problems. 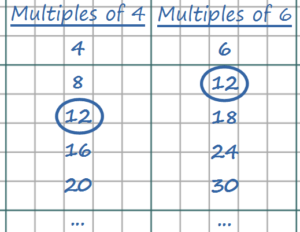 These begin with questions where students must cross-reference one set of tables against another – which number is both a multiple of 4 and 6? To answer this, you must know your list of multiples of four (4 times tables) and your list of multiples of six (6 times tables), and then compare the lists to find a number which exists in both. The questions then develop in complexity to more complicated cross-referencing. For example, which numbers are both factors of 40 and multiples of 5?